New version out and free for a limited time! Yea you heard right, version 1.4 is out with a lot of new features and improvements! The best part is, Lumberwhack is currently free for a limited time! Just download it at the App Store. 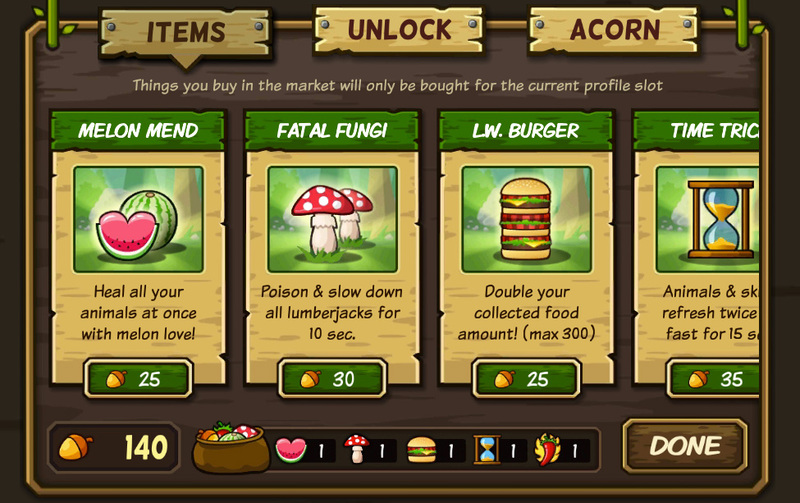 INVENTORY BAG – Poison all lumberjacks with Fatal Fungi, double your food amount with L.W Burger or use any of the other new items when you are facing an overwhelming force! MARKET – Reset your upgrades and unlock unique features for each animal! 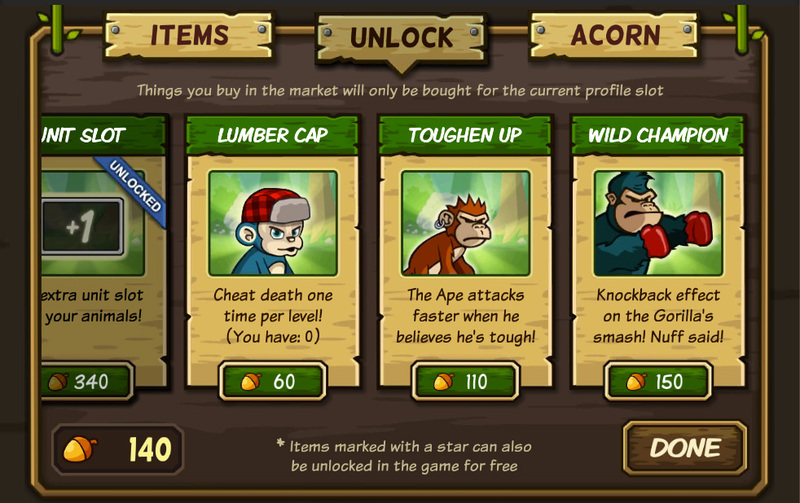 What about a pair of boxing gloves for the Smashback Gorilla or a life saving lumber cap for Koko? LEAFS & ACORNS – Leafs are now awarded instead of acorns for completing a level. Leafs act in the same way as the old acorns used to do. The new acorns are only collectable and drop more often, you can use them at the market. DAILY BONUS – Gain two daily bonus effects by sharing Lumberwhack with your friends. – Level balancing (several levels are now easier to complete). – Both animals and lumberjacks now select their targets better, resulting in longer lasting skirmishes and more fun battles. – Max level increased to 11. – The Stag and Rock n’ Roar Lion now act more cautious and should survive longer. – Nearby acorns will be collected automatically when you finish a level. – Removed one animal slot to make room for the new inventory bag. – App Store description localized for 8 more countries. You will get a free bonus of the new acorns depending on your earlier progress! The old acorns are now displayed as leafs. Please don’t worry! Leafs are acting in the same way as acorns used to do, except they do not drop on the ground and are therefor more valuable!